It has been interesting following the American presidential primaries, as a Canadian, while in England, through the eyes of the BBC, the Sunday Times, the Guardian, etc. Almost without exception, the British news outlets are perhaps even more infatuated with Barack Obama than American news outlets are. And Hillary Clinton's name is almost never mentioned; instead reports always speak of "the Clintons"--which, I guess, is what has gotten people like Gary Wills and Frank Rich concerned. The Bush tax cuts give those who earn over $1 million dollars a tax cut nearly 160 times greater than that received by middle-income Americans. At the same time, this administration has refused to tackle health care, education and housing in a manner that benefits the middle class. Provide a Tax Cut for Working Families: Obama will restore fairness to the tax code and provide 150 million workers the tax relief they need. Obama will create a new “Making Work Pay” tax credit of up to $500 per person, or $1,000 per working family. The “Making Work Pay” tax credit will completely eliminate income taxes for 10 million Americans. Granted, Obama's plan does promise to repeal the Bush tax cuts that were provided to wealthy Americans (e.g., p. 29). But when it comes to the middle class, he lapses back into the Republican-speak of tax cuts. Such a rhetoric of tax cuts has been a staple of the Democratic lexicon since Bill Clinton's shift of the party to pretty much right-of-center vis-a-vis the rest of the world. We're all Republicans now; which is just to say that we're all Reaganites now. Greetings from delightfully medieval York! Now into our second week here, our family is beginning to settle in for our five month sojourn here as I'll be directing Calvin College's Semester in Britain program, based at York St. John University. I'll be teaching a course on "Victorian Britain and Postmodern Culture," considering four 19th-century movements as anticipations of later 'postmodern' movements or themes: the Oxford Movement, the Pre-Raphaelites (as well as Ruskin and William Morris), Christian socialism (associated with F.D. Maurice and others), and the "aestheticism" of Walter Pater and Oscar Wilde. It is an entirely indulgent course and I can't wait to dive into these materials. 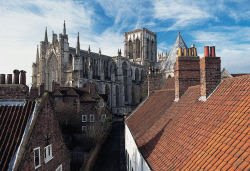 I'll also be directing a course on Studies in British Culture which centers on excursions around York and Britain, with reflection from texts by Edmund Burke, George Orwell, Roger Scruton, and others. Some of you might be interested to follow along our family adventure on our family blog, The Smiths in York. Cheers! As the cold war ended and Communism retreated, the invisible hand seemed to monopolize economic thinking. Even China, controlled by a nominally Communist party, has blessed private entrepreneurs and foreign investment. In Latin America, the International Monetary Fund financed governments that embraced market forces while shunning those that were resistant. But now the invisible hand is being asked to account for what it has wrought. In this country, many economic complaints — from the widening gap between rich and poor to the expense of higher education — are being dusted for its fingerprints.